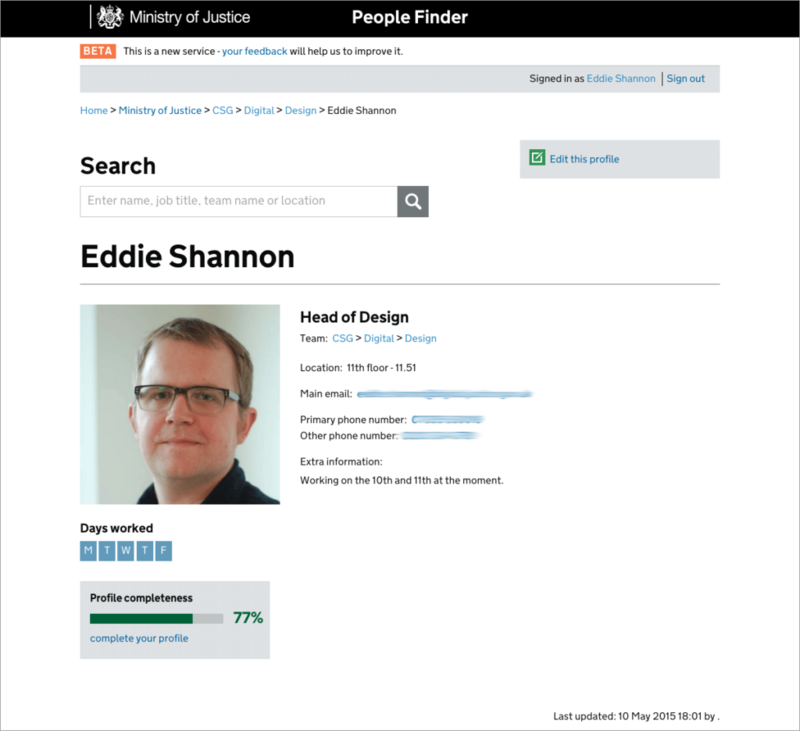 One of several internal-facing projects I’ve worked on whilst at the Ministry of Justice, this is a brand new service to allow staff across the department to find colleagues, check their contact details and learn where they are located in the organisational hierarchy. 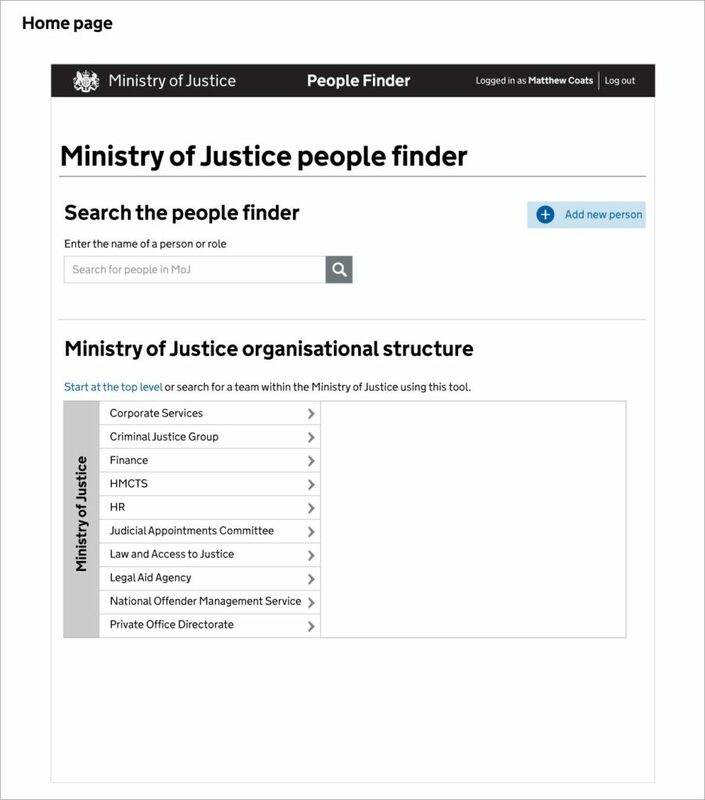 The intention is that this will replace an outmoded and underused search tool that’s only available to a certain section of MOJ staff. Initially launching as a standalone service, it will later be integrated into a new intranet that is currently being developed (as of May 2015). Like any project carried out at in MOJ Digital, the product went through multiple iterations following extensive user-testing with a range of staff, including senior civil servants, all the way up to the permanent secretary Ursula Brennan. 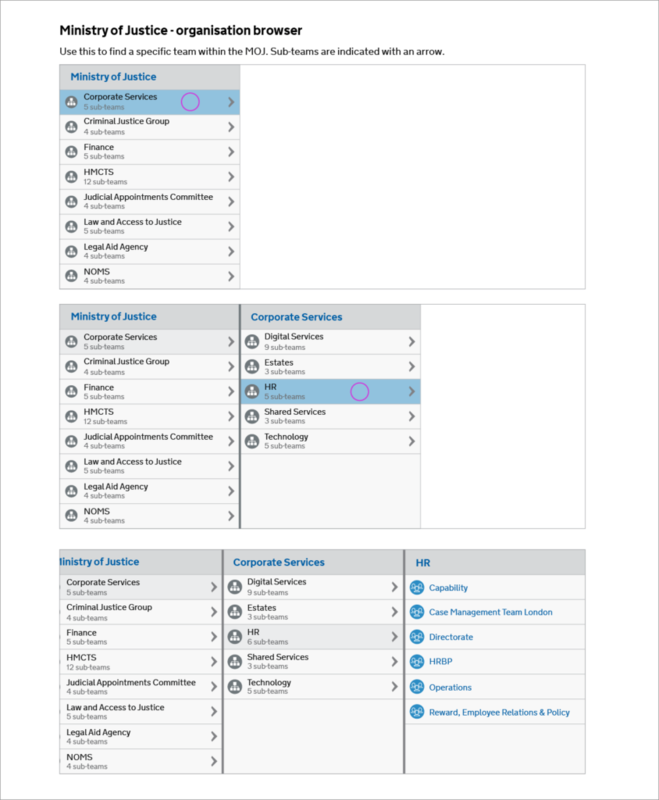 We started out with an actual organisation browser on the homepage, which allowed you to browse it and understand where the team you were in was located in MOJ. After user-testing and attempts to make it work for mobile screen sizes the decision was made to drop it and instead implement a simpler solution. 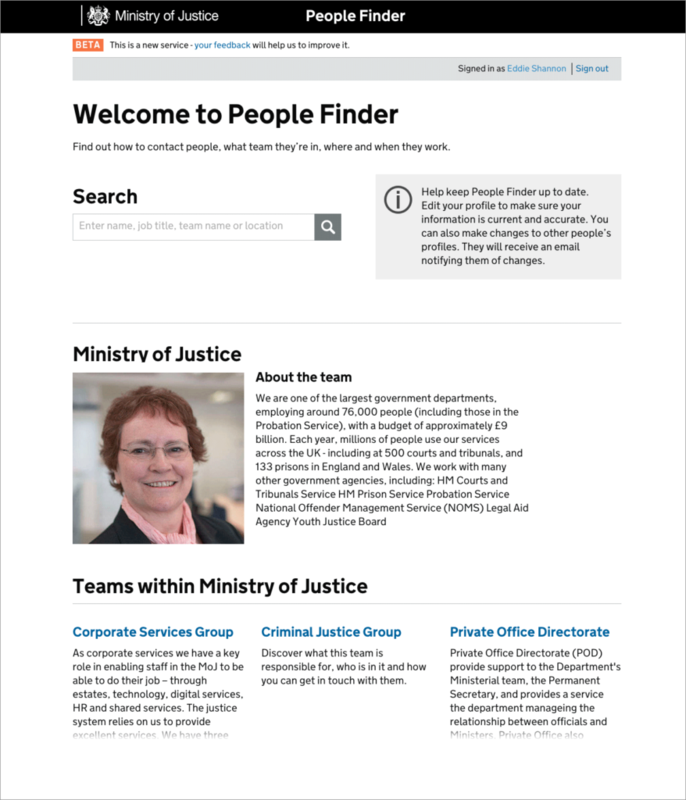 This is the current home page for the MOJ People Finder (as of May 2015). The home page features a clear search area, which research confirmed would be the primary reason for people accessing the site, as well as details about the Ministry itself that allows you to browse down through the organisation at a team level. 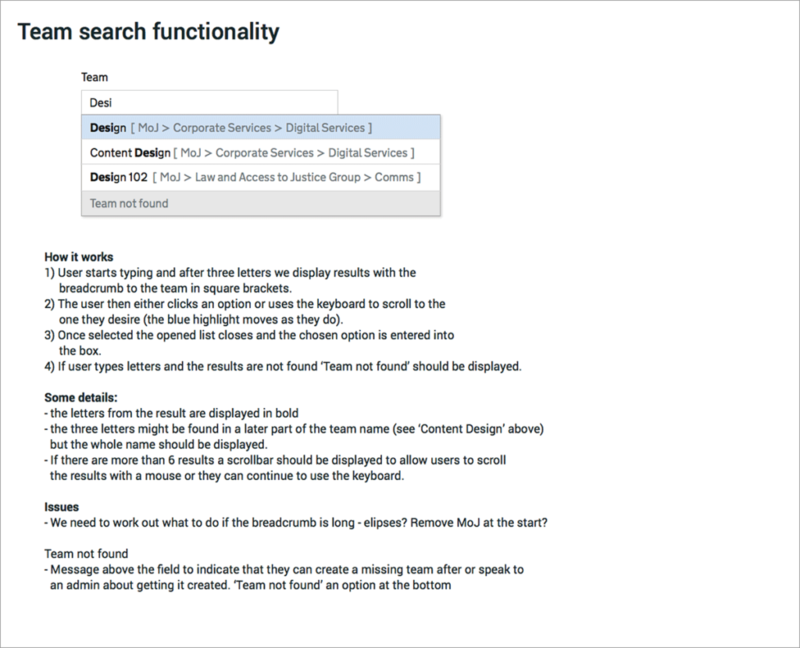 An early concept for the home screen featured an organisational browser that allowed users to see the hierarchy of the department and where their own team was located. After several rounds of testing and attempts to make it work on mobile screens the team decided to drop it in favour being able to navigate down through teams (combined with the use of clear breadcrumb trails). 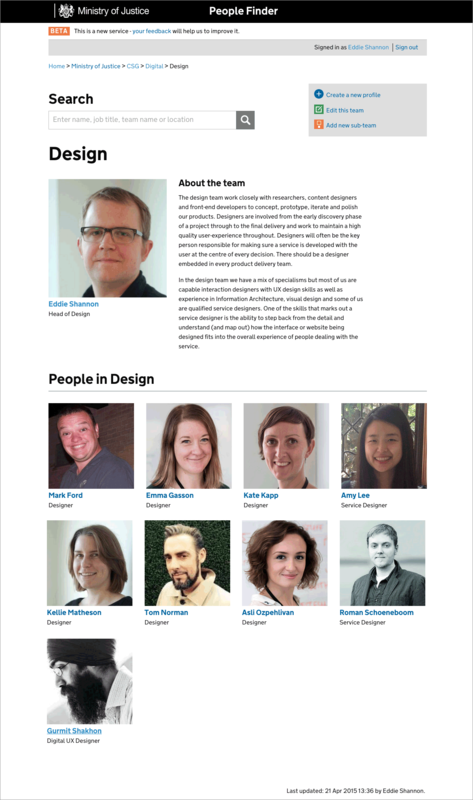 This the current design for an individual team page, which features the leader of the team at the top alongside a description of what the team’s responsibility is. The other members of the team are shown below but only if there are no sub-teams. Even if there are sub-teams there is still a link to see everyone in particular team, if the user so desires. This is the current design for the individual profile page that features the person’s contact details, as well as information about where they are located, the days they work and any other notes they wish to leave. Note that they are also prompted to complete their profile by filling in certain suggested fields. 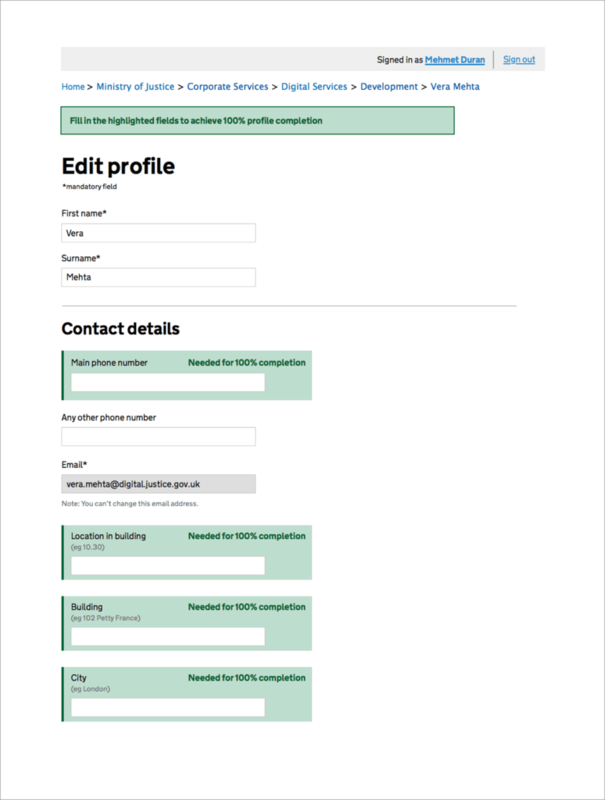 These are sample sections from the edit profile screen showing how simple it is to complete a person’s profile. The team carried out extensive testing and iterated this screen multiple times to make sure it was as intuitive as possible. This included several tweaks of the instructional copy. To encourage people to complete their profile a ‘% complete’ panel on their own page toggles the edit profile state and prompts indicate exactly which fields they should fill in to obtain 100% completeness. This is an evolution of the organisational browser that we eventually decided to drop from the service because it wasn’t an ideal interface and because we had trouble making it work successfully on mobile screens. One of the critical bits of interaction on the edit profile page was the team selection tool that allows the user to indicate where they work in the Ministry. We tried multiple ways of doing this but in the end an autocomplete search box was used. These are my instructions to help the rest of the team understand how it functions.